Fully automatic building steel welded wire mesh machine.With the development of industrial technology,pure handwork can no longer meet the needs of the market,mesh welding has been developed from manual to industrial automation,and the degree of automation is getting higher and higher.The application of automated building steel welded wire mesh machine is also becoming more widespread and has penetrated into many areas of the national economy.The welding equipment automation system promotes the rapid development of the industry and improves social productivity.It has many advantages:improving production capacity and work quality;safety and reliability of use;convenient adjustment and maintenance,improvement of performance;improvement of working conditions. 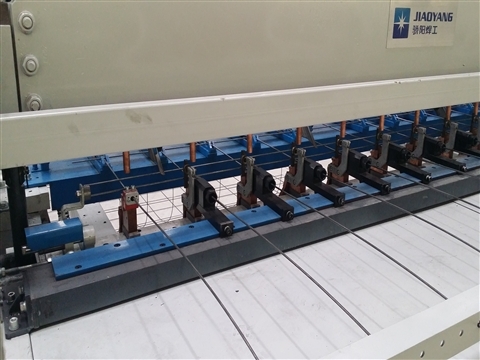 The automatic building steel welded wire mesh machine recommends the automatic mesh feeding line of the automatic coil feeding of the Jiaoyang,including the cyclone,the straightening cylinder,the straightening row and the automatic netting machine.The Jiaoyang’s machine is based on the construction mesh processing and manpower ratio of the domestic construction site.It has a new CNC series building steel welded wire mesh machine which combines the advantages of foreign advanced equipment,and a multi-functional combination of building network welding machine based on PLC programming controller and construction network welding machine supporting equipment.The characteristics of the welded wire mesh machine are: simplified operation process,high control precision,easy technology,and high-speed continuous welding requirements. The electric resistance welding used by the building steel welded wire mesh machine of the Jiaoyang Wire Mesh Machinery Factory is to press the workpiece to be pressed between the two electrodes and apply a current, which is generated by the resistance heat generated by the current flowing through the contact surface of the workpiece and the adjacent area.A method of heating to a molten or plastic state to form a metal bond.